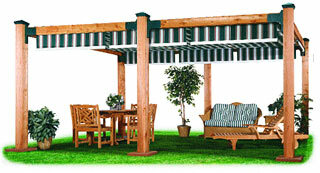 Elegant shade systems for residential & commercial outdoor living. � A tiered Discount off Manufactured Suggested Retail Pricing (MSRP) that starts at 20% off, with a maximum of 35% off. � Access to ShadeTree's Authorized Dealer Website (www.shadetreeinstaller.com). we will create CAD diagrams of your customer's proposed ShadeTree system free of charge. your installation services staff may provide (if applicable). However over 50% of systems are purchased DIY. on ShadeTree systems that are to be mounted on wood structures (50% of systems are mounted on wood). You will find that our custom, special-order program (no inventory!) is easy to implement with our on-line quote and ordering system. Simply ask your customer what size area they want to shade, and the model and fabric they desire, and our on-line system will provide a quote � at MSRP pricing, including published promotional discounts, and a picture of the model they select. Our design staff will also be happy to help design and quote unusual-shaped areas or projects. All we need is a rough sketch and dimensions of the area to be shaded, with any obstacles, such as gutters, fireplaces, etc. noted. The time to act is NOW. To ensure that your store is equipped with the display of your choice in time for the big Spring Rush, we urge you to sign up for the program today.